The 34-year-old has not yet hung up his boots and is a key member of the Koloale squad competing in the 2012 O-League. 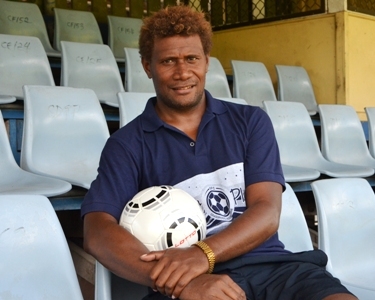 But he now has a new responsibility as beach soccer development officer for the Solomon Islands Football Federation (SIFF) and is keen to pass on the skills picked up during an impressive career to the country’s next generation of footballers. Omokirio joined SIFF a year ago after spending over a decade as a bank officer and is keen to open a fresh chapter in his life as a coach. The defender is an ideal figure to oversee the development of youngsters as he has achieved much during his playing days and boasts a CV bulging with highlights. Omokirio has proved particularly adept at the beach form of the game and has taken part in four FIFA Beach Soccer World Cups for his country. “They were all very good moments in my career,” he says. But his skills were not just limited to the sands and Omokirio made history by being part of the Hekari United squad that won the 2010 O-League – the first ever Pacific Island side from outside New Zealand to take the title in the region’s leading club competition. That groundbreaking success meant the Papua New Guinea outfit went on to compete at the 2010 FIFA Club World Cup in UAE, where Omokirio and co lost 3-0 to hosts Al-Wahda. Omokirio played the full 90 minutes of the match, attended by nearly 24,000 spectators, and says it was an experience he will never forget. The football lover still vividly remembers the moment Hekari overcame New Zealand side Waitakere United to win the O-League title and thus earn a place at the World Cup. “I just couldn’t believe that we had qualified,” he says. But even that memory cannot compete with an experience that stands out as the highlight of Omokirio’s career. He was lucky enough to play against former France international Zinedine Zidane – one of the true greats of the modern era – in an exhibition match held in 2008 to celebrate the career of Christian Karembeu, Zidane’s former France team mate and OFC ambassador. “During my time playing football I have achieved a lot of things,” Omokirio says. Omokirio’s passion for a sport he first took up as a fresh-faced 10-year-old burns as brightly as ever and he remains devoted to the world game, whatever surface it is played on. “I enjoy all the disciplines as long as they involve football. Beach soccer, 11-a-side, I love them both – it is all about football,” he says.